Kerry Nickols, assistant professor in the Department of Biology, is part of a research team that evaluated strategies to tackle ocean acidification. Photo courtesy of Kerry Nickols. 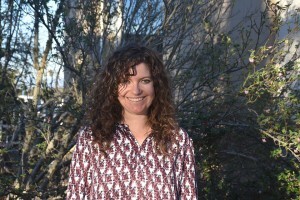 For Kerry Nickols, assistant professor in the Department of Biology at California State University, Northridge, it is important to conduct research that can have an impact on policy. With that goal in mind, Nickols is participating in a working group of 10 researchers convened by the California Ocean Protection Council and the California Ocean Science Trust, to evaluate strategies to tackle ocean acidification, a serious threat to California waters. The advisory team gathered current scientific research about the roles kelp and sea grass play in combatting ocean acidification and created a report that provides environmental policymakers guidance on future actions. It also identifies knowledge gaps. “It’s a really exciting time in California right now, because legislators want to know about climate change and want to do something about it,” Nickols said. The California Ocean Protection Council and the Ocean Science Trust published the study at the end of January. In February, their findings were presented at a legislative hearing of the state Assembly Select Committee on Coastal Protection and Access to Natural Resources. A key finding of the study is that sea grass and kelp have the potential to help reduce ocean acidification. The sea plants use photosynthesis to remove carbon dioxide from water, thereby increasing pH and lowering acidity. “It’s roughly the same idea as people planting trees to reduce their carbon footprint,” Nickols said. However, the researchers found that additional factors, such as the time of year and local conditions, can impair the effect. In areas with a strong current, the water is not sitting long enough at the same spot for the sea grass and kelp to change its chemistry, Nickols said. According to the study, investing in the protection and restoration of submerged aquatic vegetation is a “no-regrets” strategy, because in addition to potentially keeping the pH level of water high— which translates to low acidification — seagrass beds and kelp forests are important habitats for various fish species and marine life, such as oysters and abalone. The 2018 Northern California recreational abalone fishing season was cancelled by the California Fish and Game Commission, due to adverse effects the abalone suffered from current environmental conditions, such as warm water. Increased ocean acidification causes several problems for marine life, Nickols said. “The ocean water can become so acidic that it dissolves the shells of marine organisms or keeps them from developing properly,” Nickols said. The consequences of acidification would be especially measurable in aquacultures, such as oyster farms, Nickols noted. “We really need to be creative and proactive about how we are going to adapt to climate change and mitigate the outcomes of it,” Nickols said.